The famous Lake James. The “hardest lake” in North Carolina. Known to the locals as The Dead Sea. Well……Queen City Kayak Bass Fishing took her on today! Lemme start with the group of guys that camped! We had a crew camp Thursday night, and then that crew tripled in size Friday night. It was a blast. Minus extreme humidity, the weather was amazing for hanging around a campsite and sleeping under the stars. What a fun time. Weather for the event was also nice, a little hot, but nice. Maybe a slight breeze but nothing crazy. Sign in started at 4:15am and a line formed fast. At 5am we had 54 anglers paid and ready to fish! That’s an impressive number for James, a lake that people prefish and dont return. 5 ramps were open, so guys spread out nicely. Guys were catching them in practice and you could feel the excitement. 3pm rolls around and the parking lot is packed at the country club. Guys walking around in santa hats provided by Installing The Holidays. 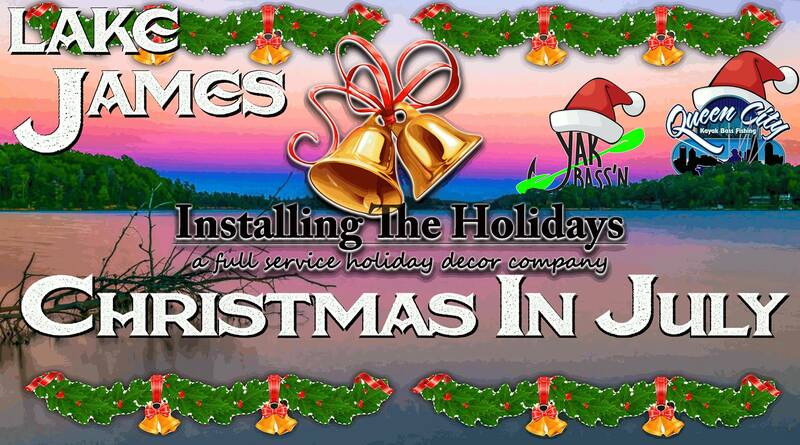 We had a Christmas in July theme going. When the smoke cleared, Euv Gnet had a big bag of 69.50inches, earning him $1000, a free haircut to Lakeside Barbers and an AWESOME trophy from ITH. Second place went home with first time QC casher Cha Xiong. He had 65inches worth $501! Rounding out the top 3, Robby Sinker, the reigning QC Champ with 59.25 worth $334. 9th PC Hawj 54.25, Wylie free entry. Yak Bass’n is the clubs small bass sponsor, and helped sponsor this #qc1000 event today. 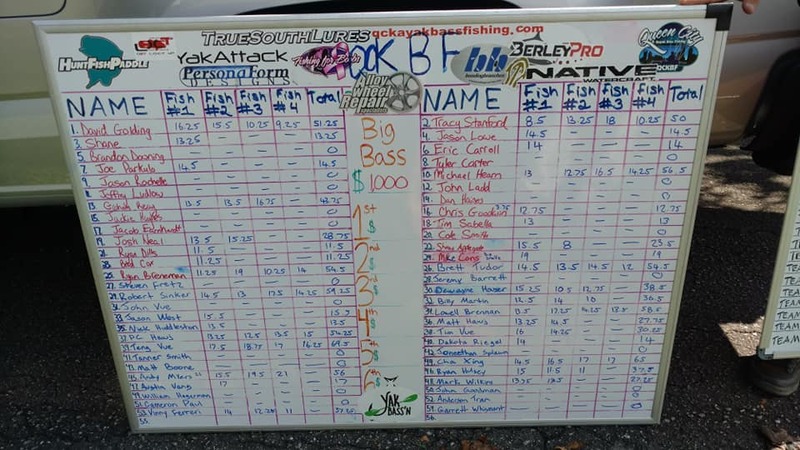 We usually donate 50% of the small bass entry to Heros on the Water, but today we paid out 100%. Chris Goodwin is running hot and smoked a 3.75incher, yep…..a 3.75incher worth $460!!!!!! He also got the plaque and some awesome Yak Bass’n gear. PersonaForm Designssponsored the largest smallie pot today, $100. Mike Constable crushed a North Carolina citation smallie, 19inches and took home the cash! The Emerald School of Excellence Big Bass award went home with Andy Myers and his massive 21incher. He took home another $270 for that! Tammy-Josh Neal and Eric Carroll took home the Pro Image Sports Team event today and Ryan Dills and Shaun Applegate took 2nd. Congrats guys. Thank you as always to our amazing sponsors that make QC what it is. We give away so many awesome items! Tracy Stanford took home another smallest limit award and brought his wife another jar of Scivation recovery. Things are going to get interesting now fellas. Round 6 is over and the drops begin next month. Those AOY standings are going to change a bunch! Keep fighting for those 15 spots in the championship! The next event is Lake Wylie on August 18th! If you cashed today please post your pics.